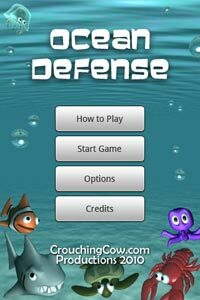 Have you got the skill and nerve to hold out against wave after wave of deadly creatures deep beneath the ocean surface? Use your judgement to strategically place a choice of lethal gun turrets on the sea bed and try your best to despatch the advancing hordes. The more enemies you destroy, the more weapons you can acquire to defeat the relentless onslaught of undersea creatures! This game is available for all Android compatible mobile phones and devices running version 1.6 or later.